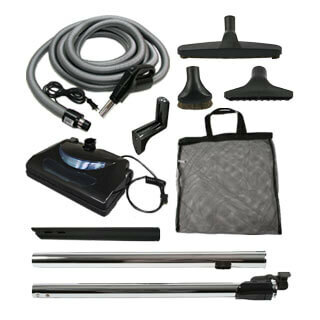 The Universal Value Electric Accessory Kit provides all the components and attachments necessary to clean a home with both smooth floors and carpet or rugs. The DustCare powerhead has a rotating brush which cleans carpet and rugs effectively. The 12" smooth floor brush with natural bristles is used to clean hardwood, tile and other bare floors. Additional attachments include a dust brush, an upholstery tool and a crevice tool. The hose hanger can be mounted in a closet or other area for storage of the hose. This package is available with hoses that are 30ft or 35ft in length and with either pigtail or direct connect ends. The pigtail style is for use with most inlets except Vacuflo, Sears, Kenmore and Budd. 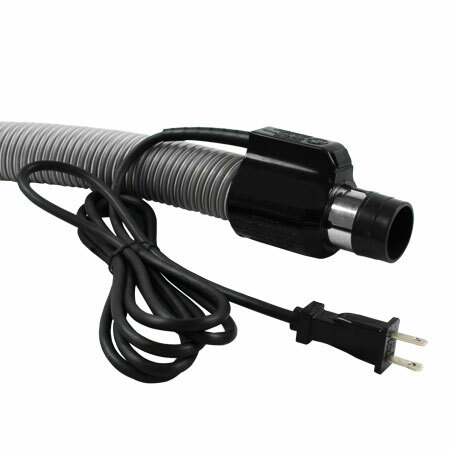 The electric pigtail cord is plugged into a nearby electric outlet. The direct connect style is compatible with all electric inlets.